This is a large village with the benfit of its own railway station, and always seems to have a busy life of its own when I cycle through. 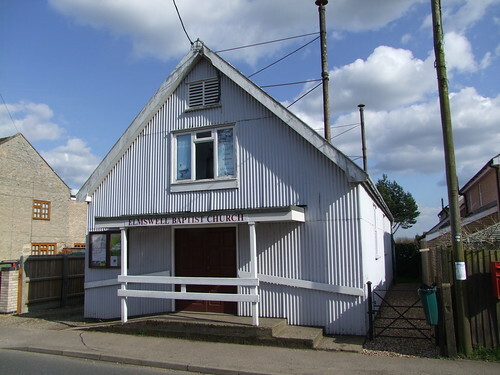 This functional tin tabernacle sits on the road to Great Ashfield, and is significant because it is one of the last tin tabernacle churches left in East Anglia. The Holly Lodge Baptist Church in Ipswich was demolished last year. There are a handful of others; but, of course, we don't build them any more, and we will miss them when they are all gone. The Baptists have long since been the most important non-conformist Church in Suffolk, but at the time of the 1851 census of Religious Worship they did not have a presence in this parish. It would be interesting to know something of the history of this particular community. Judging by their website, they appear to be from the liberal strand of the Baptist tradition, unlike their fellows at nearby Wetherden, and they certainly seem to be busy, if their noticeboard is anything to go by.